Diluting your concentrates: Save a bundle on shipping and logistics by allowing us – with our five strategically located facilities – to dilute your concentrated product and then package and ship it closer to your end user. Expanding your line: We can adjust your formulas and/or produce multiple concentrations of your product – any way you want and in any quantity you want. Lower inventory: Our multiple locations and our experience managing logistics – including transloading, warehousing and drop-shipping – mean less inventory costs for you. Flexibility in packaging: We can package or re-package your product any way you want, from 8-ounce bottles to tanker trucks and rail cars. 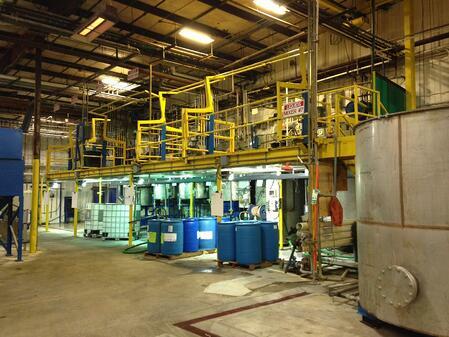 Our chemical distributions partners don’t have to invest a nickel or worry about regulations. We’ve already done it. Have a chemical distribution question? We have the answer. Do you process food ingredients? We have a very limited capability to repackage food ingredients from bulk to drums. Our broader blending, packaging and warehousing services include indirect contact such as cleaners for food processing equipment but do not include food ingredients. What are your safety and regulatory standards? Royal Chemical operates a robust EHS program and our operations meet or exceed the OSHA workplace safety standards as well as EPA’s standards for the environment. We welcome the opportunity for customers to audit our program.